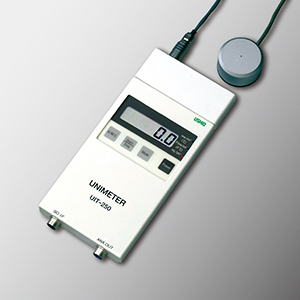 Accumulated UV meter UIT-250 | USHIO INC. The Unimeter series was developed based on our experience and expertise as a manufacturer of optical equipment. These compact optical measuring instruments are genuinely easy-to-use from the user's standpoint. These compact UV meters are used to manage the intensity of a range of instruments, including irradiation systems, as well as UV curing, cleansing and sterilizing systems. *UIT-250A can use AAA battery or AC adapter AC100V/For Japan Use Only. *The heat shield cover for the old UIT-150 model cannot be used. *UIT-250A can not use this shield. Tell me about temperature conditions for use and use procedures. Temperature conditions should be restricted to less than 10 seconds in a 300℃ environment. Use at higher temperatures will result in an "unit over temperature" error. In the worst case, damage to the equipment can result. What is the calibration procedure, and how often is calibration needed? Calibration once every six months is recommended in order to assure precision of measurement. Is the equipment provided with a calibration results report, calibration certificate, and traceability system chart? Provided as a standard feature when the product is purchased. Please contact us to request product information or to inquire about products or technology. Ushio offers support programs such as periodic inspection, maintenance and repair.